HandKrafted by Stephanie: CR84FN17 -- It's Your Day! CR84FN17 -- It's Your Day! Hello! It's time for another CR84FN Challenge! Thank you to all who joined us last week.. it was fun viewing all of your fabulous creations! 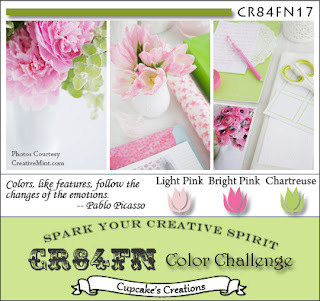 For this week's challenge (CR84FN17), our color palette is Light Pink, Bright Pink and Chartreuse. The lovely photos in the graphic above are courtesy of Leslie at A Creative Mint. I broke out some of my PTI goodies to create this birthday card. I used the Mat Stack 4 collection (stamps and die) for my label. The birthday hat and sentiment is from 2011 Birthday Tags. I added a strip of seam binding and tied off a couple of bows with some Cotton Candy dream string from Pizzazz Aplenty. Accessories: Mat Stack 4 die (Papertrey Ink), Circle punch (EK Success), Apron Lace border punch (Fiskars), Markers (Copic), Seam binding, Cotton Candy dream string, Shiny silver pearl (Pizzazz Aplenty); Foam tape, Thread, Sewing machine. 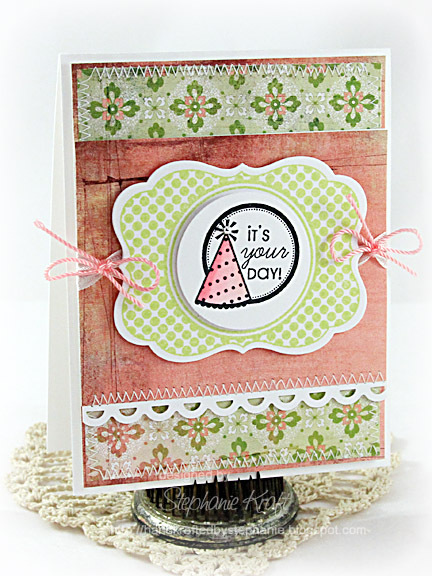 I love the birthday sentiment topper, with the pretty bows and such gorgeous papers! This is lovely! Fabulous card, love the fun hat image and gorgeouse papers. The twine looks great against the green stamped label, so pretty. I love that birthday image with that cute hat. That polka dot label is gorgeous and these little twine bows are a lovely addition. Gorgeous use of patterned papers. Love this! Super sweet card! Lovely design and papers as always! The double bow twine touch is such a nice touch! Such a sweet card, love the fun image. Such a beautiful card Stephanie! I love how you've used the PTI goodies!! The patterned papers are so darn pretty too! Such a wonderful birthday card, sure to make anyone's day!!! Great use of the challenge colors! Wonderful BD card, lovely choice of BG papers to coordinate with this weeks colors! I love your color combos! Thanks for letting me check out your creations! such cuteness, stephanie:) love your polka dot frame, hat and twine! CUTE birthday card, Stephanie! LOVE how you tied the bows on the seam binding! So FESTIVE! This card makes myday! So cute Stephanie! Thanks so much for the CR84FN 17 inspiration!